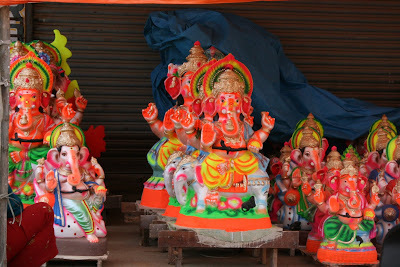 Ganesh is one of the important festivals for us and just the atmosphere around makes you feel so good about it. Yesterday was another important festival of Muslims , Ramzan. 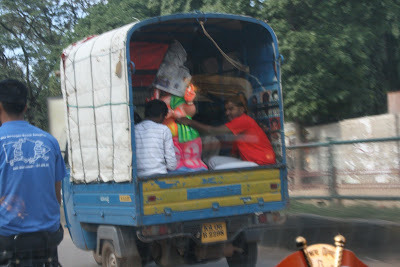 While on the way to Goa, yesterday, I could see the people enjoying both these festivals. On one end you see the muslims wishing each other and also at the other end, the hindus, getting the Ganesh idol to their homes. Witnessing both these festivals all throughout my journey, the thoughts and comparisons of these festivals were going around in my mind. Apparently some places couldn't celebrate the Id yesterday, as the moon was not seen. Ironically, for the Id, moon has to be seen in the local area, while that for the Ganesh, as per the legend, one is not supposed to see the moon. Today also happens to be 9/11. A day the people of US and for that matter the whole world will never forget. 9 Years ago, while this incident happened, we had reached New Jersey, just a couple of days back. From JFK to New jersey, one of our colleague showed us the Twin Towers from the Brooklyn Bridgle, and that remained as the last time. I still remember while we had gone to "Enterprise" to pick up our car on that tuesday morning, everyone at the car rental office was busy watching the TV. 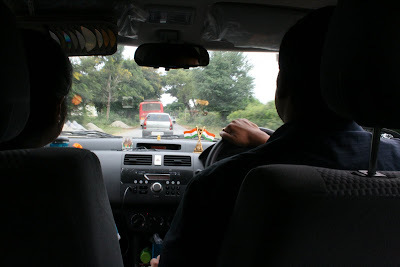 We didnt bother to ask them much as we were more excited to get the car, and discussing about the route to office. Once we reached office, everyone in the office was just glued to the TV in the reception area. We all left from work early that day, but not before sending an email back home that we are fine. All the phone lines were just jammed. After a month or so, when we went to see the ground zero, it was one sad moment. The pain was in the air. Only time can heal such wounds. Coming back to my journey from Bangalore. This time I chose a different route. 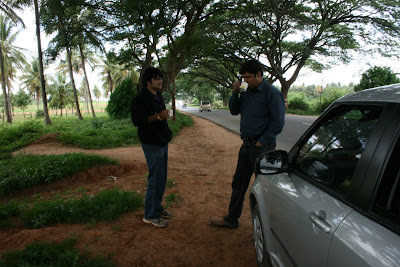 Since I had a colleague with me, who had to get off at Shimoga, we took the route from Shimoga. Though we started at 5:30 in the morning, it was quite a mad rush due to the long weekend which came after a long time and also the celebration of 2 important festivals. 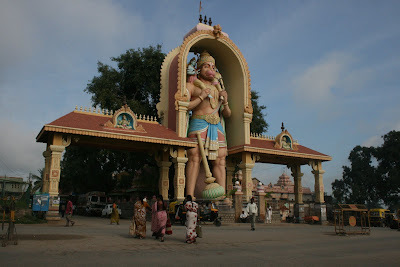 We started on the NH-4 and after tumkur took the NH-206 which would take us to Shimoga and eventually to NH-17. In short the road was bad. And to add , since it was festive period, there were too many people in the market. 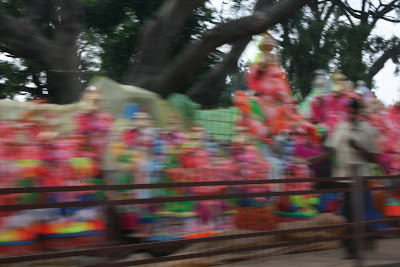 Though, it was fun to see all the different colours of festivals, it was quite a pain to drive. We did take some small break's in the middle to enjoy some tea or just to take some pictures. At around 12:30 noon we reached Girish's place. We had an awesome lunch at his place and started from there in an hour's time. The initial part of the travel looked good. We were told to go via Sirsi rather than to Honnavar to hit on to NH-17. 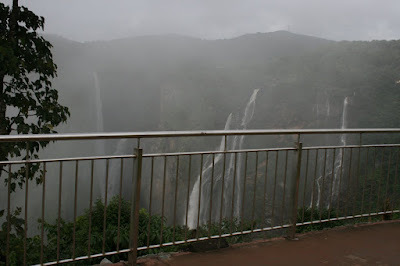 On following the road, we ended up reaching Jog Falls. 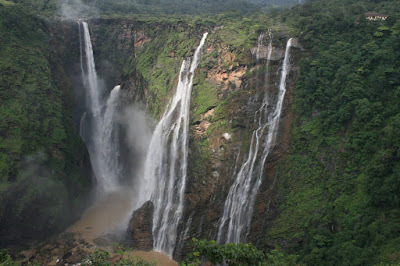 Since it was just 2.5 kms off the main road, we reached the falls and trust me, it was well worth it. I was seeing the falls after 15- years approx. The new developments looks good out there and quite safe. From then we looked to go towards Sirsi. I guess we missed out that turn, since all the road directions were in Kannada only, and we ended up on the Honnavar road. Well thats one of the worst road, I can say. Its all winding and full of bad pothholes. Our car got hit at the bottom a number of times. Finally around 6 we reached the NH-17 and that road seemed like heaven. It was very smooth but there were some poth-holes but not dangerous from any manner. We needed to stop at Karwar, and that we reachd around 8. And then finally reached home only at 10:00 pm..
Definitely, not as smooth as my previous trip, but at the same time, got to know a lot of new places and driving experience.